The biographies of the generation of the 1930s are interrupted by the war with fascism. Lifshitz departs for the front. In September 1941, he is wounded. He serves in the Dnepr Flotilla. The flotilla is defeated. Lifshitz finds himself surrounded by the enemy. He spends September and October of 1941 slipping through enemy lines. This photograph was taken when he finally made his way to friendly troops. Dmitry Gutov was born in Moscow in 1960. 1978 - 1980 Studied at the Lenin Moscow State Pedagogical Institute, Moscow. In 1992 Graduated from the Repin Institute for Painting, Sculpture and Architecture, Saint Petersburg. 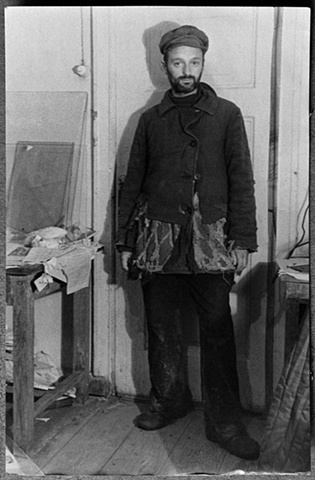 Lives and works in Moscow. Recent solo exhibitions include The Deep Blue Colour Of His Skin Shows Just How Self-Absorbed He Is. Matthew Bown Gallery, London (2005), Correct Wrist Movements. M. Guelman Gallery, Moscow (2006), Repetition, Canon, Comeback, Deceleration, Stupor. The State Tretyakov Gallery, Moscow (2006). Recent group shows include Returning of Memory. Kumu Art Museum, Tallin (2007), La 52 Biennale di Venezia. Venice, Italy (2007), Dokumenta XII. Kassel, Germany (2008).